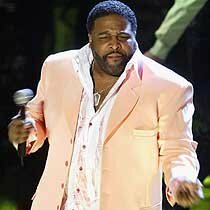 R&B singer Gerald Levert has died at his home in Newbury, Ohio. His family said it appears he died in his sleep, possibly of a heart attack. Gerald was 40 years old. He leaves behind 4 children. His father, Eddie Levert is founder of the legendary O' Jays whom he collaborated on an album titled Father and Son. Levert scored again success as a member of the R&B group LSG (Levert, Keith Sweat and Johnny Gill). LSG released its first album in 1997 titled "Levert.Sweat.Gill." In 2005, Levert's daughter Carlysia was featured on an episode of MTV's "My Super Sweet Sixteen, his lateast cd was also released this year entitled "Voices". It's always a sad day when a parent outlives their child. He will be missed. I'm still trying to wrap my mind 'round this. You and I both Keli.. I was shocked. Actually, I still am. May be rest in peace, didn't he just do a show with his Dad? We must appreciate everyday we are on this earth. SHOCKING! My blessings are with him and his family. He will always be remembered, I remember his daughter on my super sweet sixteen. my condolences go out to him and his family. I was shocked to hear of his passing, my heart goes out to his family. Gerald Levert was the man! This is really shocking and extremely sad. I was hoping it was a rumor when I heard this on yesterday. As bad as I hate to hear this news, I can only imagine how his family is feeling right now. May God bless them all.